Image | This entry was posted in Chronicle of Mideer and tagged Gene Trees, Supplement. Bookmark the permalink. 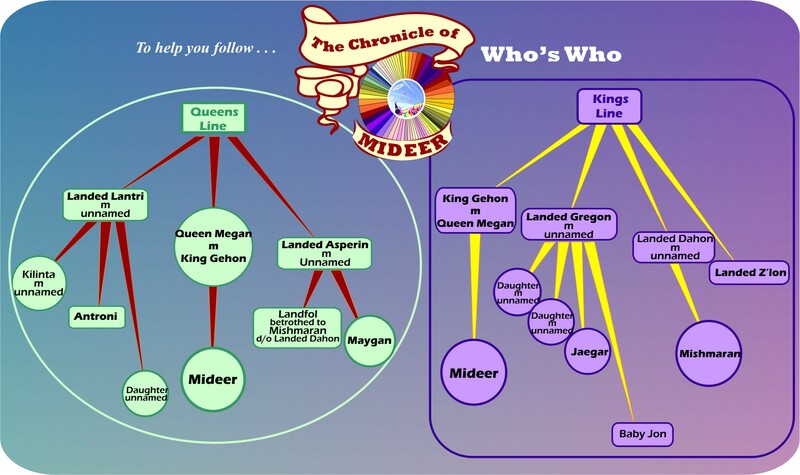 Were it not that she’s not the type (at least so far), Mideer might have considered the quaint custom in some dynasties of killing off all her rivals once she ascended the throne. But as you say, she’s not the type. Though maybe they’ll wipe each other out, all trying to take control, and thus leave the throne vacant for her. I’m sure this has happened, I just don’t remember (top of head) when, or where. Both the families of Augustus and Constantine the Great got thinned out remarkably quickly. See, I knew I knew it really. And all I could think of was Yorkists & Lancastrians. But of course there were still some Yorkists left when the Tudors climbed onto the throne. Which Henry VII did his best to get rid of. I think Henry VIII even took steps against a few of them.